Vice President Joe Biden, in Denver to raise money for Sen. Mark Udall’s re-election campaign, avoided hot-button topics like health care, the Keystone XL pipeline and a potential state ballot issue that could ban fracking. Instead Biden talked about about the need for immigration reform. “We have eleven million good people who need a good shot,” Biden said during a photo-op meeting with Udall and Denver Mayor Michael Hancock at a local coffee shop, per the pool report. “I believe in immigration reform with all I have,” Biden said. Later, Biden hosted a private fundraising event for Udall and the Colorado Democratic Party, earning himself criticism from the Republican National Committee. 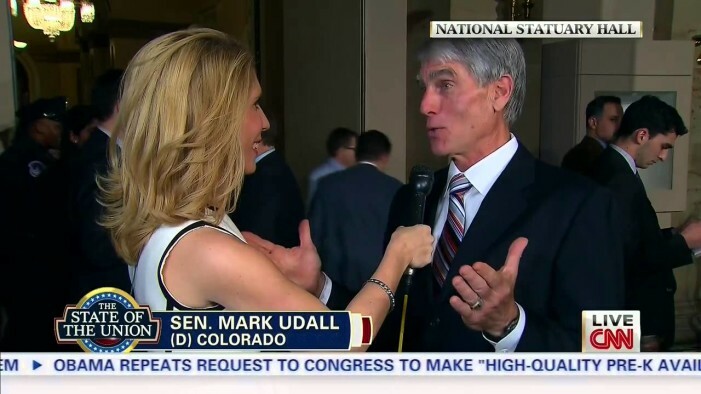 “It’s no surprise that after supporting President Obama 99 percent of the time that Mark Udall’s being rewarded with a closed-door fundraiser with the Vice President,” RNC spokesman Michael Short said in a statement to the Denver Post. The Gardner campaign weighed in as well. “Vice President Biden’s trip to Colorado is another vote of confidence from President Obama in Sen. Udall’s ability to carry out his agenda,” Gardner’s campaign spokesman, Alex Siciliano, told Denver’s Fox 31. “While Senator Udall attempts to distance himself from President Obama publicly, he has been more than happy to vote with the president 99% of the time — and now Vice President Biden is coming to reward him financially,” he said. The reference was to a cringe-worthy moment on CNN after Obama’s State of the Union address, in which Udall dodged three direct questions about whether he would invite Obama to campaign with him. On Wednesday, Biden delivered the commencement address to graduating cadets at the Air Force Academy in Colorado Springs. His wife, Jill Biden, was schedule to hold a “Women for Udall” fundraiser there on Wednesday as well.